Description of "Siebel ADM Blackbook (eBook)"
ADM Customer Scenarios related to Customer Business Release , Major Functional Release - Full & Limited Repository , Minor Functional Release is covered in detail. ADM Deployment Considerations like Managing Packaging content , Using Recovery Features are also discussed. Installation & Configuration of Management server and Agents for ADM is also covered in detail along with Screen shots. ADM Functional features are covered like Framework features , User process flows. ADM Architecture is also covered. It also covers ADM Registry File. It also covers ADM Deployment steps , Deployment flow , Sequence , Serial / Parallel Deployment , Deployment Modes as well as ADM Troubleshooting. AAMRU is an MBA currently working as a Project Manager for a large MNC. 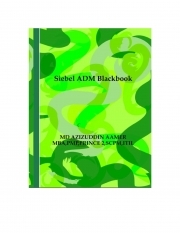 Reviews of "Siebel ADM Blackbook (eBook)"